Heat oven to 400 degrees. Grease muffin tin(s). Mix flour, sugar, baking soda, salt and cinnamon in medium sized bowl. Quarter oranges and blend in blender or food processor until finely chopped. Mixture will look like the most pulpy orange juice ever. Since your blender/food processor is being used anyway, throw the rest of the ingredients in with the oranges and let it mix them for you. Add the orange mixture to the dry ingredients and stir just until combined. This mixture makes 12-18 muffins. 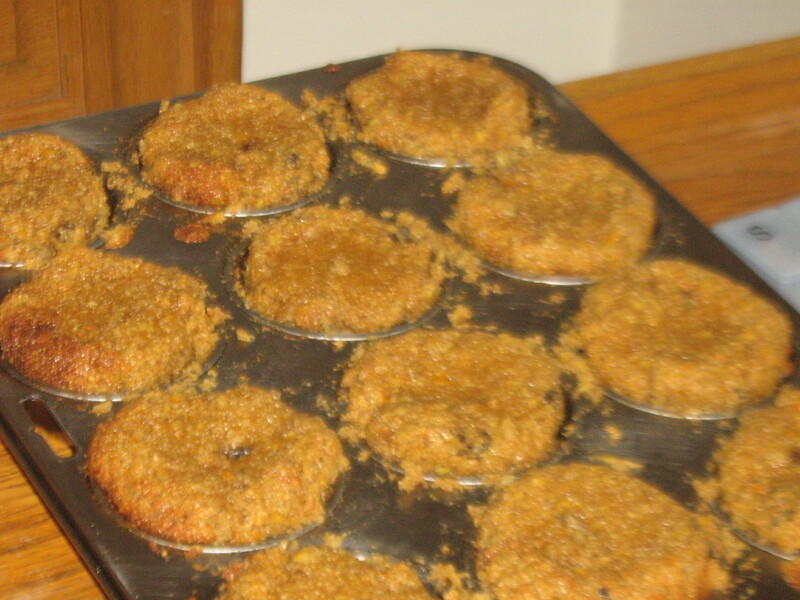 I made 12, so they were large, but they came out very flat and spread across the top of the muffin pan. To deal with this I pushed the tops back with a knife while they were still hot and soft so they’d come out of the pan in one piece when cool, but next time I’d probably just fill the muffin tins to 2/3 full and make more muffins. Bake at 400 for 20 minutes or until toothpick inserted in center comes out clean. Next time I might try sweetening with half a cup of honey and cutting the pineapple juice back to 3/4 of a cup. I revisited a GAPS recipe today. I’m always looking for more high protein breakfast ideas, and I also happened to be trying to use up the rest of a #10 can of pineapple before it went bad. We’re fans of pineapple around here, but not to the point that I can be confident that the two of us will eat an entire #10 can of it before it goes bad. Enter, GAPS pineapple upside down cake. 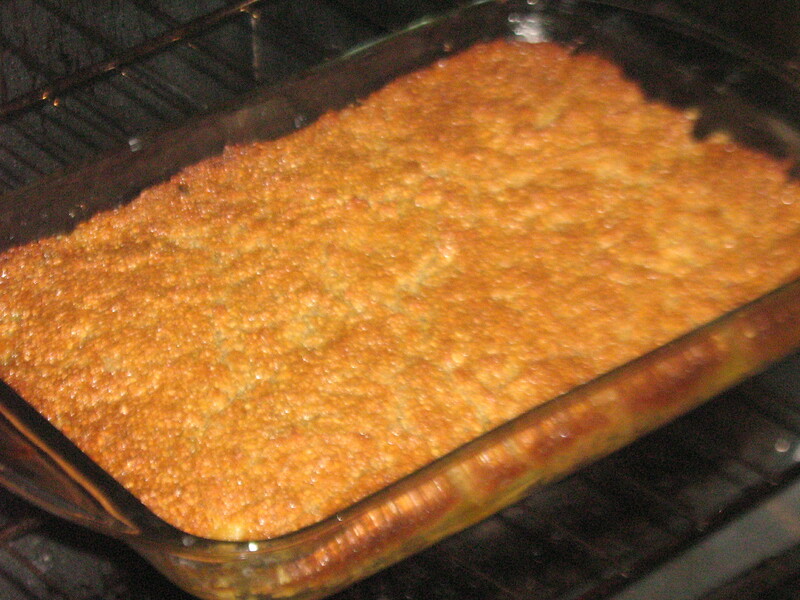 I might adjust the name to ‘pineapple cobbler’ now, but it’s essentially the same recipe. Since I originally just posted links to all the recipe components I put together to make my recipe, I’m posting the entire recipe here, in one place. Melt 1/2 cup butter in 9×13 pan in 300 degree oven. Mix flours, salt and baking soda. Add eggs, pineapple juice and other 1/2 cup melted butter. Add honey to 9×13 pan and mix with melted butter. Add pineapple. Return to oven for 5 minutes. Pour batter over pineapple mixture and cook at 300 degrees for 60 minutes or more, until toothpick inserted in middle comes out clean. You can use other ratios of sunflower seed flour to coconut flour–using just sunflower seed flour will produce a very dense cake, using just coconut flour will produce a lower protein, lighter textured cake. Adjust ratio according to your desired outcome, or to what flour you happen to have on hand. You can substitute agave for part or all of the honey. You can substitute coconut oil or other neutral flavored oil for the butter to make it dairy free.